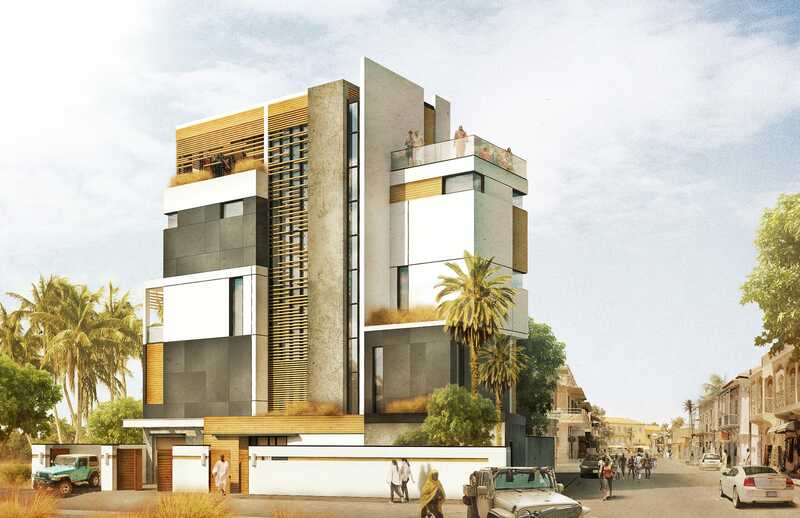 A schematic design for a beach house in the Dakar region of Senegal on the west coast of Africa, this 9,000 square foot residence provides sweeping vistas towards the ocean side, while maintaining a sense of privacy and security from the street-adjacent facades. The design includes five bedrooms, five full bathrooms and two powder baths, a theatre with terraced seating, and two full kitchens. The master suite occupies a full floor with private terraces, his and hers closets, sitting area, and built-in kitchenette. The roof top garden and spa has unobstructed ocean views and built-in fireplaces, infinity spa, and trellised open kitchen and al fresco dining room.